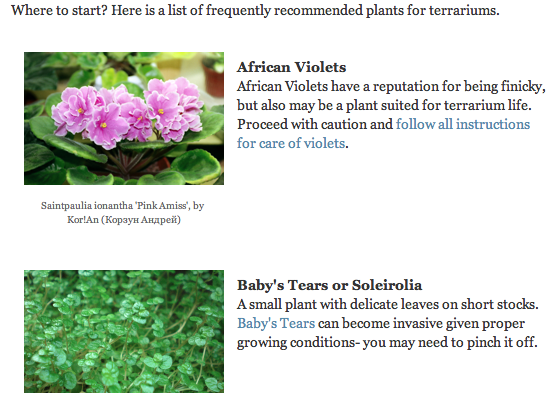 Check out the new and improved, comprehensive list of plants for terrariums. If you are searching for a new type of plant to try in a terrarium, or are new to terrariums and are looking for plants that are suited for terrarium life, this list (complete with photos) should give you a good start. Am I missing any plants that you have grown in a terrarium? Tell me in the comments! I picked up a Nepeta cataria (catnip) in the checkout line at my local pet store and it has been going bonkers in 3 different terrariums. It grows so fast I have to keep pruning it every week or so, but the cats love it! Awesome! I will add it to the list!